Raging Bull is an online casino site that accepts players from all countries excluding Mauritius, Netherlands Antilles, Israel, Costa Rica and South Africa. Given its flexibility with welcoming players from countries where casino membership can often be restricted, Raging Bull is becoming a popular place for a range of players to try online slots and other casino games. But is this casino worth playing at? We put Raging Bull and it’s casino software to the test. Can Americans play at Raging Bull? Yes, Raging Bull is one of the few reputable online casinos that welcomes players from the USA, with real money deposits accepted using USD. Raging Bull is a safe, trusted place for American slot fans to play for real money online. Raging Bull Casino caters to players of all preferences, offering the option of downloadable software and an instant-play casino which requires no downloads. However, the downloadable casino is only available to PC users, so Mac users are limited to the browser-based site. While both options are quite similar in their offerings and layout, the downloadable casino client does offer more games than you will find at the instant-play desktop or mobile site. The minimum requirement for downloading Raging Bull’s casino software is a Pentium 133Mhz with 8 MB of hard disk space, 16 MB of RAM with either Windows 98, 2000, ME, XP, NT, Vista and Windows 7 operating system. The sign-up bonus is only available to players from Belgium, Canada, United States (and outlying areas), United Kingdom, Australia, New Zealand, France, Italy, Sweden, Norway, Finland, Singapore and Hong Kong. Players from any other country can only reap the benefits of this bonus offer after first making three successful real money deposits. The welcome bonuses are subject to wagering requirements of between 25-35X. There are several progressive jackpot games to choose from, but these are local area progressives so the jackpots don’t tend to go beyond a few thousand dollars. While the Realtime pokies collection may be a tad underwhelming for players who are used to multi collections from top-brand game studios like NetEnt, BetSoft, Quickspin and iSoftBet, Raging Bull does offer a good variety of pokies, especially for players from countries like Australia and America where reputable casino sites are becoming more difficult to come by due to restrictive online gambling laws. Does Raging Bull have mobile pokies? Yes, Raging Bull offers a nice user-friendly mobile site for players who prefer to spin the reels on the go. The mobile site is compatible with all data-enabled smartphones and tablets, including iPhone, iPad, Samsung Galaxy, Windows Phone and most other major brands. The same selection of bonuses and promos are available and you’ll find the full range of pokies available at the desktop site optimised for mobile play. Raging Bull also offers a range of video poker variants, including Aces & Eights, All American, Bonus Poker, Deuces Wild, Jacks or Better, Joker Poker, Loose Deuces and a few others. There are no live dealer games or scratch cards on offer at Raging Bull. Withdrawals can only be made using Wire Transfer, Skrill, Neteller, Bitcoin and ecoPayz and there is a standard 48 hour processing time on all cash-out requests. We were unable to find any information about the minimum and maximum deposit and withdrawal limits available. Raging Bull provides 24/7 customer support via live chat, email on [email protected] or help line at 1800 751 529. There’s also an FAQ section available which covers most general enquiries. 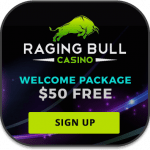 Is Raging Bull recommended for online pokies? 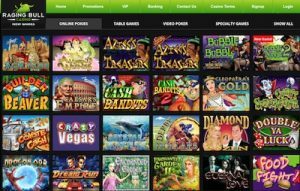 If you’re content with playing online slots from a single software provider, then Raging Bull is a good choice, but for those who would rather branch out beyond Realtime Gaming software you may want to check out our other recommended casino sites.